Medical implants are typically not designed for pediatrics. This is partially due to current implant technologies inability to accommodate growth in the patient. A team at Boston Children's Hospital has created a new implantable device which uses biopolymer core and a braided sleeve. These two elements allow the device to elongate over time. While many challenges exist, the hope is that this new technology may be used in children who undergo cardiac surgeries. Currently, children may require several additional surgeries to re-pair or replace the heart valves. This growth-accommodating implant may increase durability for pediatric heart valves, overall decreasing the number of heart surgeries required. 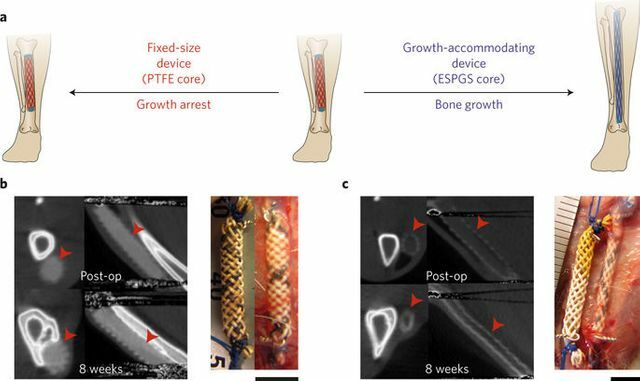 Devices made with resorbable polymers and braided materials can accommodate tissue growth in long-bone and heart-valve animal models.